Happy Saturday Morning my sweet Gypsy Soul Laser Cuts friends!!! 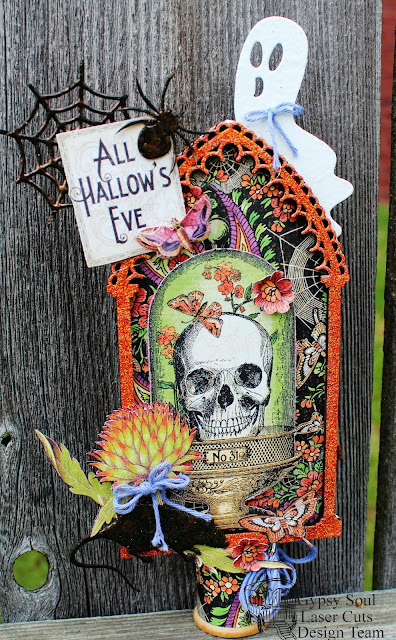 I have really enjoyed creating fun Halloween Home Decor this year and I am hoping to inspire you to do the same. Cover Reliquary Arch Top with pattern paper. Fussy cut two like images from pattern paper. Add one to top of Reliquary Arch Top. Apply Boss Gloss and embossing powder to top of Reliquary Arch Top; heat set with embossing gun. Adhere embossed Reliquary Arch Top to top of prepared inside piece. Add second fussy cut image to Reliquary Arch Top with pop dots. Emboss spider and rat with embossing powder. Emboss ghost with embossing powder. Emboss spider web with embossing powder. Wrap spool with pattern paper. Adhere prepared Reliquary Arch Top to top. Adhere sentiment to top of Reliquary Arch Top along with prepared spider web and spider. Adhere prepared ghost to back of Reliquary Arch Top. Fussy cut two flower images from pattern paper. Add to Reliquary Arch Top. Fussy cut second image and place on first with pop dot. Adhere prepared rat to Reliquary Arch Top. Fussy cut a couple of small flowers from pattern paper and adhere to Reliquary Arch Top. Check it out along with stopping in at the Gypsy Soul Laser Cuts Store to check it out!!!! Pam, I just love this! I never would have thought of the burnt copper not the rat, web, and spider but that looked so awesome! And the relic frame is fantastic. Now I'm excited about Halloween. Pam, this is fantastic! I love the embossed frame, rat, spider and web, and all together just a fun Halloween project with so many wonderful details! Love that arched frame! Hugs!